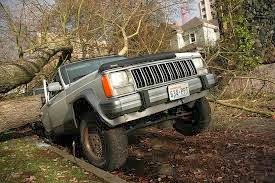 High Winds Safety Tips - Begin Prepping Now!! Preparing for high wind problems is much the same as prepping for other issues. It’s about thinking ahead to what might happen, and fixing problems before they occur. Wind damage can be frustrating and costly. Prevention is key. Take down any banners, flags, bird feeders, or decorations that can flap around or blow away. Scoot all your patio chairs up around the table, and wrap a rope around the whole thing. The rope acts as a corral and the table lends protection and weight to the chairs. The best place is against a building. You may also scoot the whole set close, and tie the ends to a railing or tree. Flip trampolines over, then put sand bags or railroad ties on it for weight around the frame. Anything heavy will work. You just have to keep the edges down. If you have things in your yard that might blow over, Lay them over yourself. IF you lay it down, you control the landing, and your beautiful ornament is much less likely to be broken. Make sure your garbage cans are secured. Tie them to a tree if need be and bungee the lid shut. Put your car in the garage. This protects it from being pelted by sand and debris off the roads and yards. If your garage is too full of stuff to put a car in, make a vow to clean it out this year! Make sure the gas tanks in your cars are full. Check the fluid levels in your rigs. You Don’t want to be running around out there, but if an emergency arises, you can’t stop to get gas if the power is out. They have no pumps. Make sure you have plenty of water on hand. Fill all your pitchers and pots, and set them on the counter. 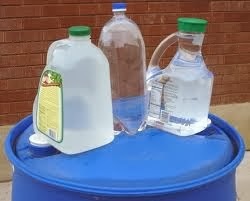 After the storm, it’s no biggie to dump some water out, but if the power goes out , you will be mighty glad to have it. Wash all your dishes and laundry, the more of that stuff is done, when the power blinks out, the less hassles you will have. Make sure you have enough paper plates, bowls and silverware to eat for at least three days without washing anything. You don’t want to waste water. Make sure everyone is showered. Again, if nothing happens, an extra shower is no biggie. But if the power goes out for three days, you will be mighty glad you started out clean. Stock up on fuel, in or close to the house. Whether it’s wood, kerosene, or propane, make sure you have some on hand. Make sure you have food on hand that can be eaten cold, or heated by your heat source. Have buckets filled for watering pets. Fill the bathtub with water. If the power goes out you can use that water to flush toilets. These are some simple steps that can keep you safe in a major wind event. Stay home. With cars being blown off the road, power lines falling and trees being knocked over, you are much better off to be tucked in at home safe and away from the chaos. Stay safe!! Very useful tips you give for people in preparation for High Wind storms and the aftermath that comes with. Nice Job! Wind can be very hazardous, and it can happen anywhere. Small precautions save big hassles. Very nice article! I’m all about being prepared. The last financial meltdown woke us up in a big way in our family. So thanks for the tips! I am glad your family is preparing. I think it is a journey…not a destination. But the first step( and the biggest) is to know you need to get started. That puts you way ahead of the curve! Glad to see you here.